It is always difficult filling the summer with fun camps for kids. With Evan the decision was easy, soccer! He loves soccer and when I saw there was a soccer camp I registered him to go. Last year he attended TetraBrazil Soccer Camp and loved it. This year we decided to try out the British Soccer Camp which is also part of the Challenger Sports camps. Last year his camp was outside and with a full day program it was way too hot. This year I learned my lesson and signed him up for a program at Tyngsboro Sports Center so he could be in an air conditioned facility and not over heat. The other cool thing is another one of his friends from his team this year also went so they could hang out together. They got to do drills and then also play games. Evan liked it as he could try out all different positions including Goalie. There is a half day option of 9:00-12:00 and a full day option of 9:00-4:00. Evan did the full day option. He was also excited to get a cool shirt that came free with our registration. Evan is on a Travel Soccer team which is coached by parent volunteers. You are at the mercy of how well versed the Coach is in Soccer Skills. I wanted to make sure Evan got to learn from some experts. Plus the kids had access to a snack bar to buy lunch or drinks throughout the day. 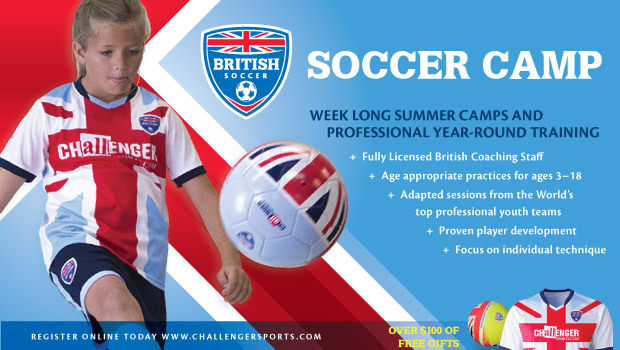 Enroll you child in a British Soccer Camp today Enroll in British Soccer Camps Today! Challenger Sports Camps has many options including Fall and Spring Academies. These Camps are for kids 3-18. Sign up now for your kids to have some fun and learn some great skills! Disclosure: I will receive a free week of Soccer Camp for my son thanks to the USFamilyGuide. No other compensation was received and all opinions are my own.